I think a gift is much more personal if it includes a handmade gift tag. 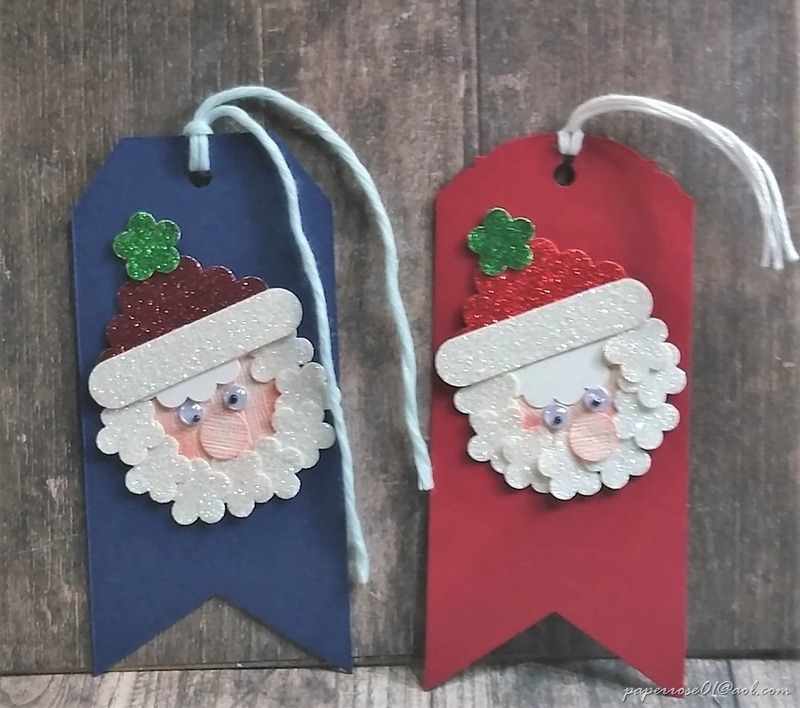 Daughter Debbie and I had fun creating these and now you can make them for your gifts. We have precut assorted colors of card stock to 5 X 2”. This size fits the Banner Triple Punch and the 3 topper punches. In this image, you can see 2 of the topper punches I have. You can cut a different color slightly smaller piece of cs as I have done with the white here. The second color is 4 7/8 X 3 3/4 – 4” and is finished with an edging punch. 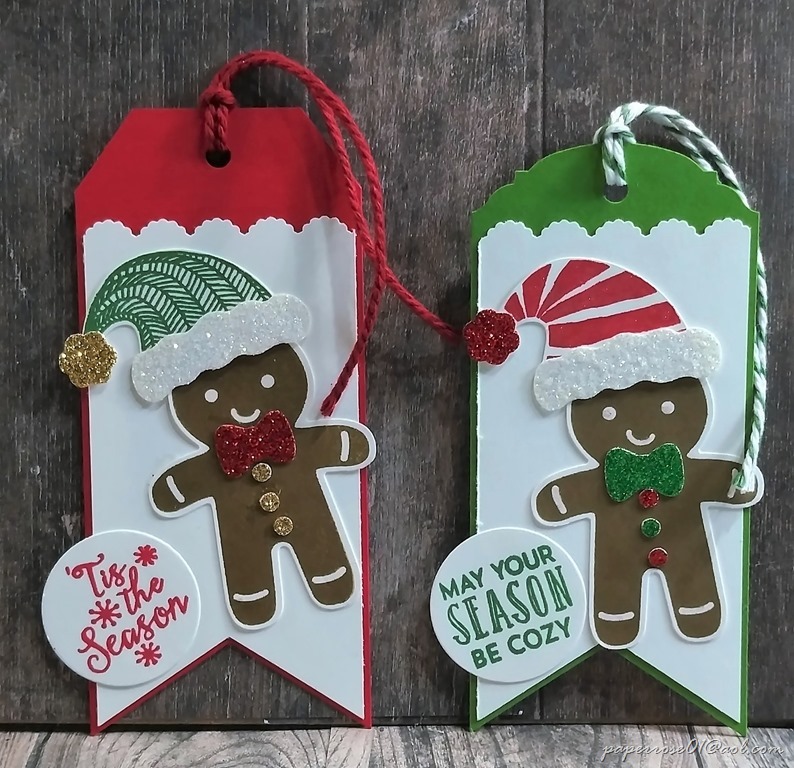 The Cookie Cutter gingerbread people are some of my favorites and they make such a cute tag! The stamps are available for several hats, hat trim, bow ties, and buttons. A small circular sentiment was added and the “To and From” message is on the back side of the tag. I must admit that this is my favorite gift tag. It is from the Many Blessings stamp set. The images were stamped with Memento black and colored with Stampin’ Blends. The “MERRY Christmas” stamp is included in the set. I tried to choose the available Baker’s Twine to coordinate with some aspect of the card. The Baker’s Twine can also be colored with Stampin’ Blends. The “To and From” sentiment is on the back of these tags. If you are into punch art, this is the tag for you! Santa faces are created from assorted punches, glimmer paper, and googley eyes. We trimmed this tag to make it a bit shorter. The Santa face could be moved lower and the “To and From” sentiment could be placed on the front or the back. 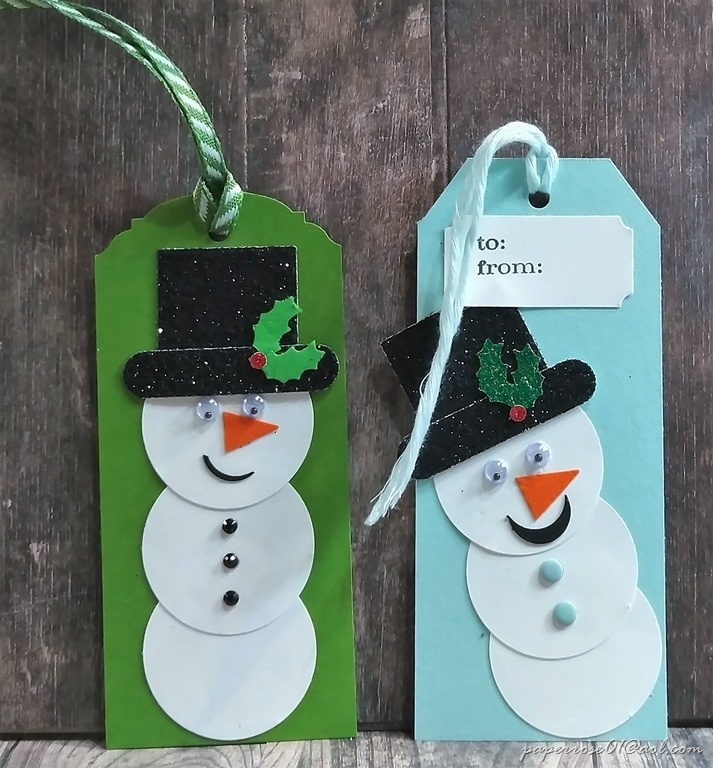 Snowmen also make cute gift tags. These are also punch art creations, but are a bit simpler to punch and make than the Santa faces. The Snowman smile is actually punched from small circle punches and/or balloon punches. The hat is formed from a small square punch and the word window punch. If you want to make a fast tag or two – choose the reindeer. 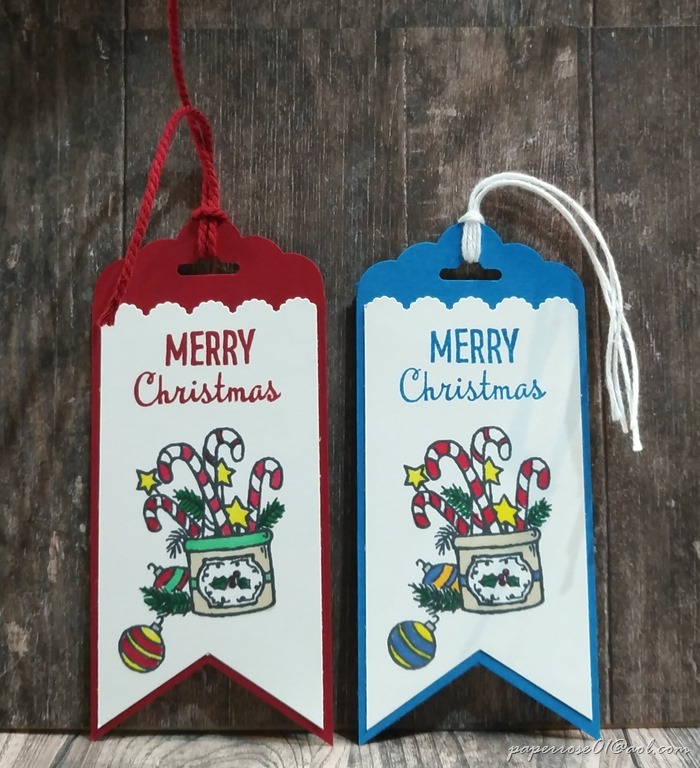 This is a very simple gift tag. 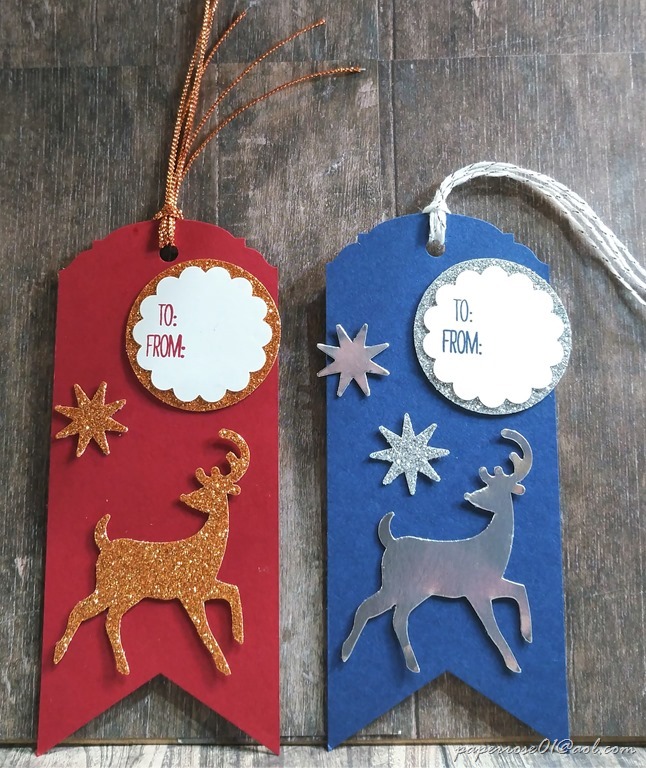 Simply punch out the reindeer and star either in glimmer or metallic cs or a mixture of the two. A simple “To and From” punched and layered on coordinating glimmer cs and you are almost done. I added 3 strands of 6” copper cording to the left image and 2 strands of 8” Baker’s Twine to the right image. I will admit I was “fooling” around with these 2 tags. The tree tag is pretty simple. The Washi tape was colored with the Shaded Spruce Stampin Blend to coordinate. The penguin tag has a very busy Washi Tape background. I took a basic tag and I punched the banner and topper. I then took a second basic tag, punched it to match and adhered the two together. This way the tag was neat and the messy Washi tape backing was hidden. The snowflake tag is our final idea. 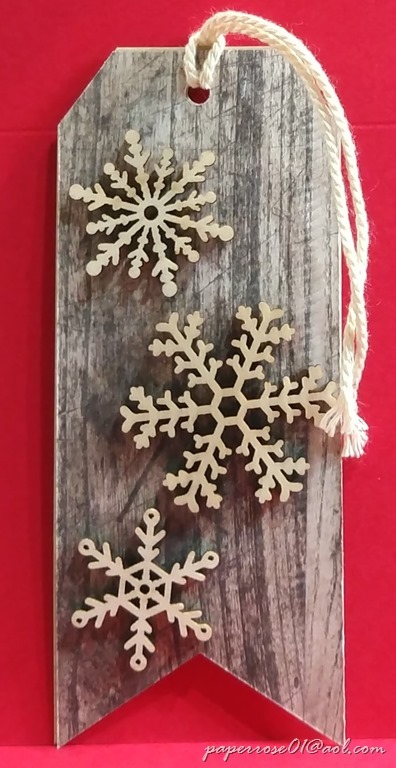 These are retired wood or plastic snowflakes that are adhered to a double tag. The Wood Textures DSP is perfect for this wintry tag. It is backed with a regular cs tag to provide the weight to handle to heavier snowflakes. This is a very quick and easy tag! The “To and From” message is on the back. These tags are ideas from Daughter Debbie and me. There are other punches that can be used and lots of paper. Try to think “out of the box” and see what you can come up with. Debbie went thru my miscellaneous drawer and pulled lots of embellishments you can use to make tags with, in addition to our ideas. You can do all tags, all calendars, do all stained glass window cards – the choice is yours. I just ask that you let me know when you may be coming and if you wish to do the stained glass window cards – how many of which one. As a reminder, December Stamp Camp is being held on Thursday November 29th from 12 Noon to 7 PM, Friday November 30 from 2 – 7 PM, and Saturday December 1st from 9 AM – 4 PM. The cost is $12 and covers whatever you choose to make. Soda and water and some type of goodies will be provided for your enjoyment. I have decided to take the month of January off from Stamp Camp. The craft room needs a major overhaul and I HATE the cold weather. So, our next Stamp Camp will be on Thursday, Friday, Saturday, February 7, 8 and 9. We will have a Valentine plus everyday theme. 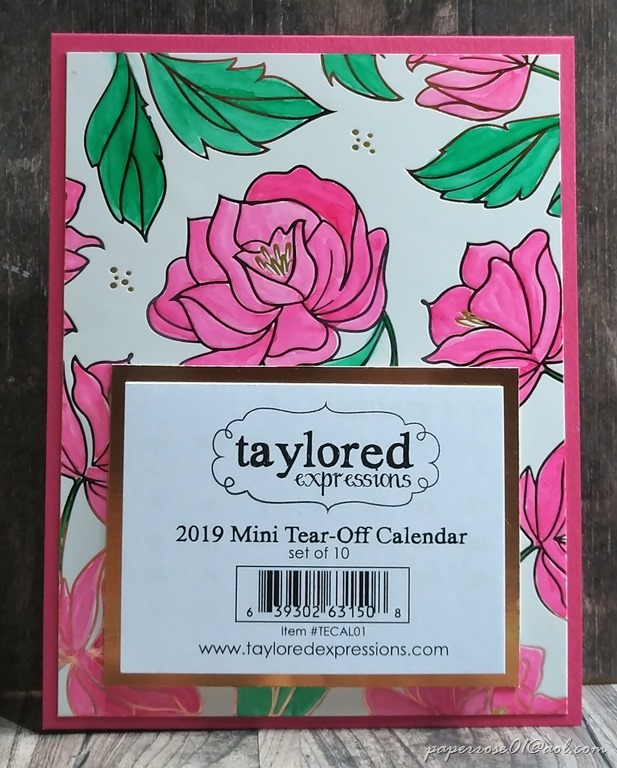 I will be putting out a 2019 calendar in January and will keep you advised of Stampin’Up specials. Your new Occasions Catalog and Stampin’Up Sale-A-Brations brochure will be arriving in December. I love the opportunity to make these cute calendar gifts. I gave one to my mother last year, my stylist, several friends, and 1 for my craft room and 1 for my refrigerator. These can be done free standing or flat with magnetic strips on the back. You can decorate them as you wish. These 2 free standing calendars are both embellished with copper metallic foil. The navy calendar has copper and navy flowers and the calendar is framed in copper. The polka dotted calendar has a copper flourish adhered to the front and the calendar is also framed in copper. This cute butterfly calendar has the same dimensions as the other calendars but is made horizontally instead of vertically. The butterfly DSP was cut this way in error so if you choose to use this beautiful background, you will need to cut your cs horizontally. This image shows the side view of the upright calendar. Cut a cardstock base at 4 1/4" x 11", and score at 5-1/2". Fold the card in half and burnish the edge with a bone folder. Cut another piece of the same color cardstock at 4" x 4", and score at 1/2", 2" and 3 1/2". Burnish the fold lines to create the easel. Glue the 1/2” tabs to the inside of the card base. You can see the glued easel in this side view. If desired, adhere a piece of 5 1/4 X 4 white cs to the back face of the easel for your sentiment. Prepare the card front as desired. Adhere 5 1/4 X 4 DSP or card stock to the calendar front. 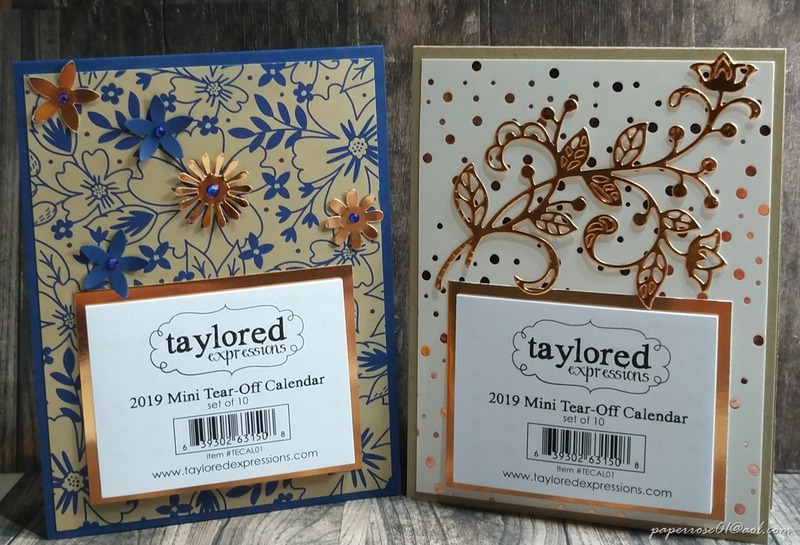 The Taylored Expression mini calendars measure 3 X 2 1/4. Adhere your calendar securely (I use liquid glue or Sticky Strip) to coordinating card stock that measures 3 1/4 X 2 1/2. After allowing the calendar to dry, adhere it securely to the calendar front. Adhere embellishments as desired. We have pre-cut a large assortment of DSP for the calendar fronts. Daughter Debbie has volunteered to man the paper cutter and cut the calendar frames and easels from the card stock you choose. You can choose to make up to 10 calendars or you can choose to make a lesser amount along with the other offerings. Don’t forget to let me know if you may be coming – November 29th from 12 Noon – 7 PM, November 30th from 2 – 7 PM, and December 1st from 9 AM– 4 PM. Blessings, Rosemary – ( H )630.759.3089 – ( C )630.965-1965 – paperrose01@aol.com. Hi Crafters! It’s hard to believe that Thanksgiving is over and Black Friday is upon us. Although I personally think the entire month of November has been Black Friday. Christmas means much more than getting and giving gifts. Sometimes the birth of Jesus is forgotten as the REAL meaning of Christmas. I need to preface this card with the fact that this is not a Stampin’Up set. It is titled “Oh Holy Night” and is from Taylored Expressions. When I ordered our 2019 calendars, I saw the stained glass stamp set and the coordinating arch framelits dies and decided to purchase both. On the negative side, this stamp is very difficult to use and get even coverage. This may be because I was stamping on vellum. Thanks to the Stamparatus, I was able to stamp multiple times but even then, there were some areas that simply would not stamp well. This card has a So Saffron card base with a Cherry Cobbler layer that was embossed with a retired starry embossing folder. 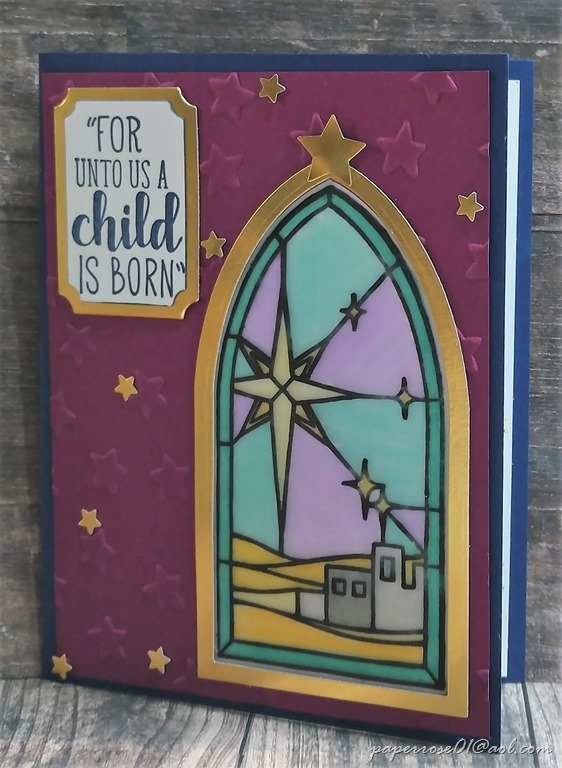 The stained glass image was stamped on vellum and colored on the back with both Spectrum Noir and Stampin’ Blends. It is a must to color on the back to keep the StazOn ink from smearing. After the window was colored, it was adhered to a piece of white cardstock. An arch was die cut from the front layer card stock before it was embossed. The colored window adhered to white cs was adhered to the back of the front layer and the layer was adhered to the card base. A gold metallic arch was formed using 2 framelits sizes. The top card has a wide arch and the Navy/Blackberry Bliss card has a thinner arch. Again, these are Taylored Expression dies – not Stampin’Up. Each arch that I die cut came out wrinkled. 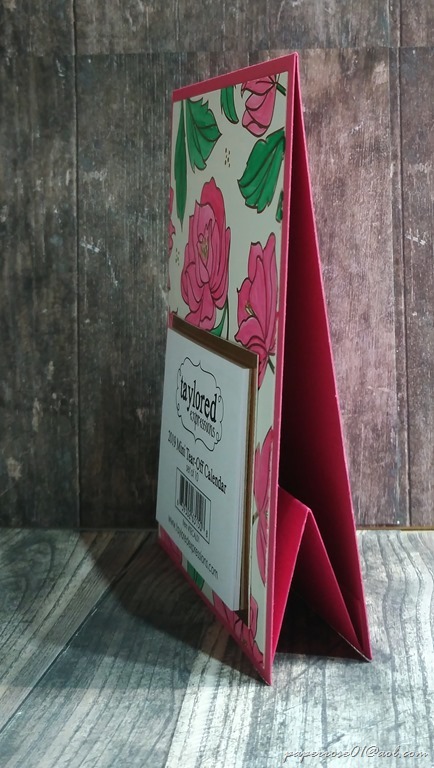 I “ironed” out the wrinkles by placing the die-cut arch on the bottom cutting pad, covering it with several thicknesses of scratch paper or card stock, adding the top cutting plate and running it thru the Big Shot several times. This method “irons” our those wrinkles. Die cut “Peace” was adhered to one card and a sentiment framed in gold was added to the card with the thinner arch. 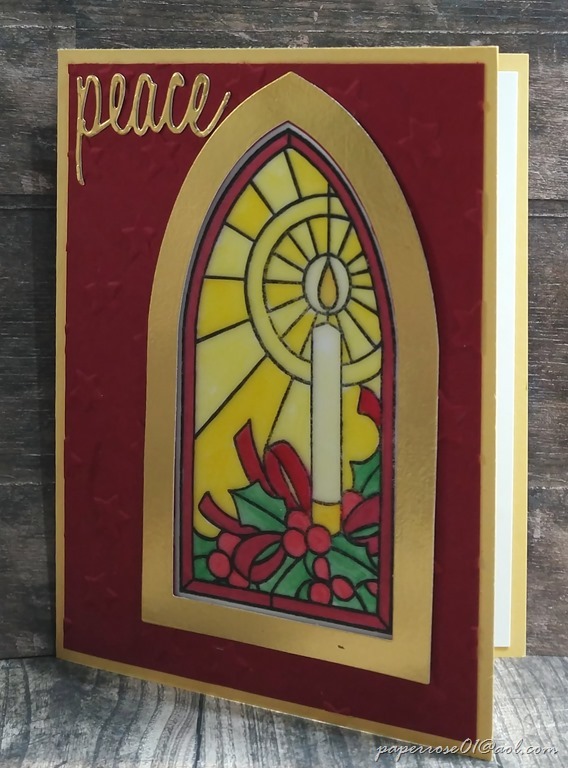 The stained glass window cards are just 1 offering for December Stamp Camp. You can also choose to do calendars and/or tags. YOU will choose what you want to create. You can do all stained glass window cards, all calendars, all Christmas tags or a mixture of each. I would ask that you let me know if you wish to stained glass window cards and which ones. I need to insure there are adequate windows stamped with time to dry. Remember – December Stamp Camp is an oxymoron as it is being held on November 29th from 12 Noon to 7 PM, November 30th from 2 to 7 PM, and December 1st from 9 am to 4 pm. You can come when it is convenient for you. The cost remains $12.00 for whatever you choose to make – a pretty good deal!!!! It is helpful if you let me know when you may be coming, and letting me know if you will be doing the stained glass window cards and how many of which one. Stay tuned for 2019 calendars – the next blog post for December Stamp Camp. Let me know if you have any questions or concerns. I hope you are enjoying our Independent Stampin’Up! 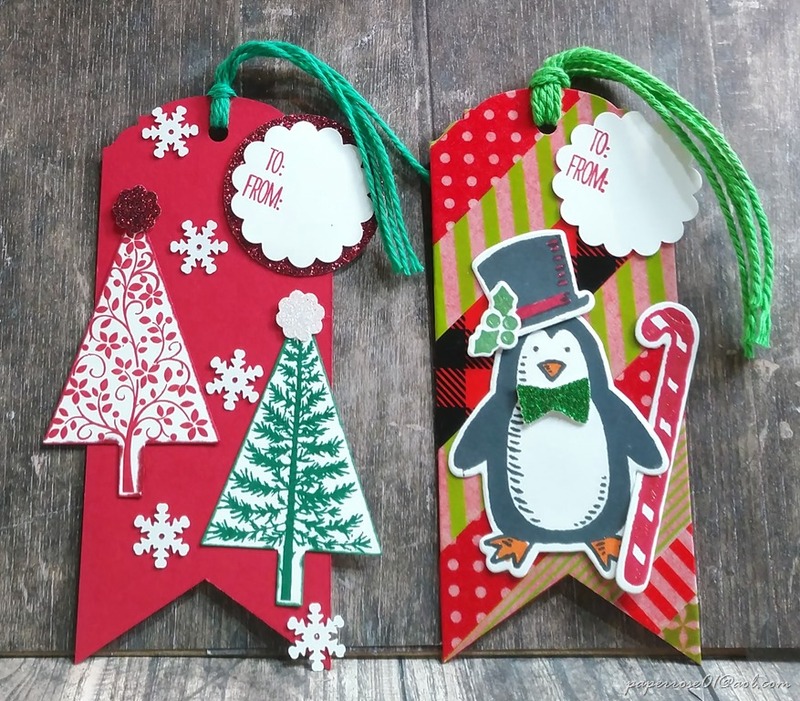 Demonstrators Blog Hop featuring holiday projects. Fellow demonstrators from all over the globe are participating so we have a wide array of fun projects to share with you! You may have arrived from Katie’s blog. She had a great project! I fell in love with Winter Woods at first sight! Having the In The Woods Framelits Dies made this purchase a MUST! 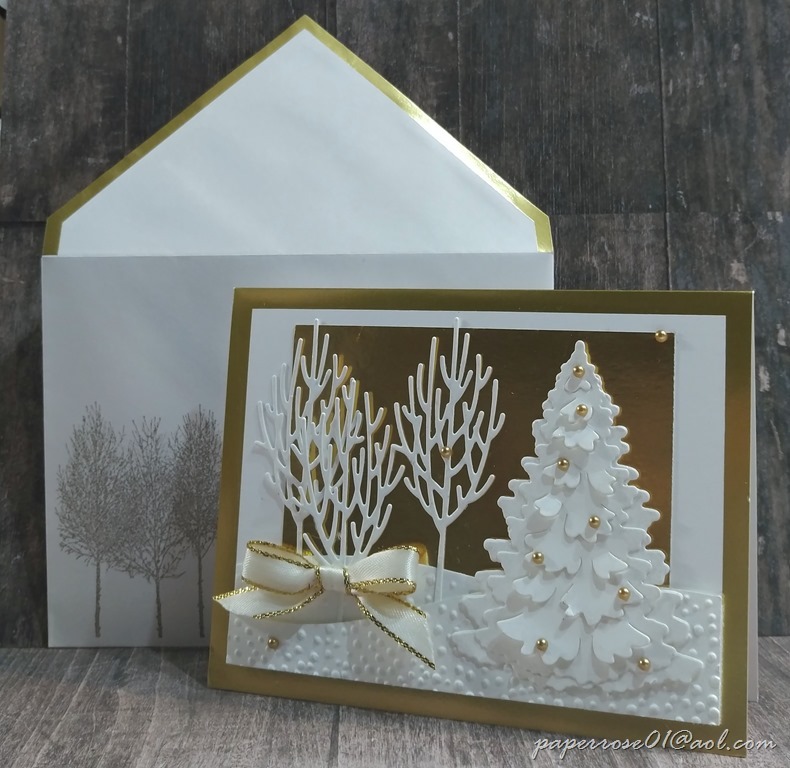 The Foil-Edged Cards and Envelopes in gold were perfect for this wintry scene. A background of 4 X 2 3/4” Gold Foil was ideal for the white trees. The 3 “branch” trees and fir tree were die cut with Whisper White. Wink of Stella was used to edge the fir tree and branch edges, and covered the “branch” trees. Each branch of the fir tree was raised slightly with rolled-up glue dots pushed to the back of the branch. The 2-layer snowy hill was formed with the hill slope die and embossed with the Softly Falling Embossing Folder. The “branch” trees were tucked into the snowy slopes and a shoestring bow of 3/8” Gold Metallic-Edge Ribbon graced the base of 1 tree. The branched fir tree was adhered to the large tree and adhered to the gold background with Stampin’ Dimensionals. Finally, gold Metallic Pearls embellished the branches of the fir tree. Because I am a firm believer of stamping the envelope to coordinate with the card tucked inside, I used Smokey Slate to stamp the multiple “branch” trees on the envelope front. This is such an elegant card. We did find that one of my Big Shots cut the “branch” trees better than the other. Using a shim for cutting and removing the trees with the foam pad and brush also eased the process. Thanks for hopping by to view our creations. Have a Peaceful Christmas! Now it is time to zoon to Sandra’s blog to see her holiday creation. Before you go any further, PLEASE READ THIS: WE WILL NOT BE RUNNING THE ART LAYER THRU THE SUBTLE EMBOSSING FOLDER AS SHOWN ON THE IMAGE BELOW. The bouquet is not as distinctive because of the embossing folder I used. However, I am out of time to make a second card and process the blog. Today is my birthday and things have been busy-busy-busy. This picture simply does not do this card justice. The galvanized metallic paper is gorgeous after embossing with the “Tin Tile” dynamic embossing folder. I have sponged the metallic paper with Basic Gray to make the embossing stand out. However, the paper is beautiful without the sponging. The chicken wire element is to the right of the card. I adhered it by squirting some of my taking my favorite Tombo Adhesive Multipurpose glue on my silicone craft sheet, dipping a sponge dauber in the glue and running the dauber over the back of the chicken wire. This worked perfectly. The fall bouquet is stamped on Whisper White and colored with Stampin’ Blends. By embossing the white cs, the bouquet is muted and doesn’t jump out the way it should – so no embossing the bouquet!. The pitcher was cut with the Stamp’n’Cut, colored with Stampin’ Blends and adhered with glue dots. Wink of Stella was brushed on the bouquet and areas of the pitcher. The art piece is mounted to black cs and adhered to the card front with dimensionals. Finally, Braided Linen Trim is wrapped around the front with a simple shoestring bow. This Thanksgiving card I will be proud to send to friends and family! November Stamp is right around the corner – Thursday, November 1 from 1 – 7 pm, Friday, November 2 from 2 – 7 pm, and Saturday, November 3 from 9 AM – 2 PM. Please note the Saturday hours. I hope you can come. The class fee is the same – $12 for any 4 cards, and $2.50 for additional cards. Please let me know if you will be attending and which cards you would like to make. Looking forward to seeing you. I love the “Country Home” stamp set. It is perfect for Thanksgiving, a fall birthday or any occasion. As I look at the card, I suddenly realize that I FORGOT TO USE THE GALVANIZED METAL PAPER. I will make sure we use the correct paper for Stamp Camp. However, even using the Basic Gray card stock, the card is still beautiful. 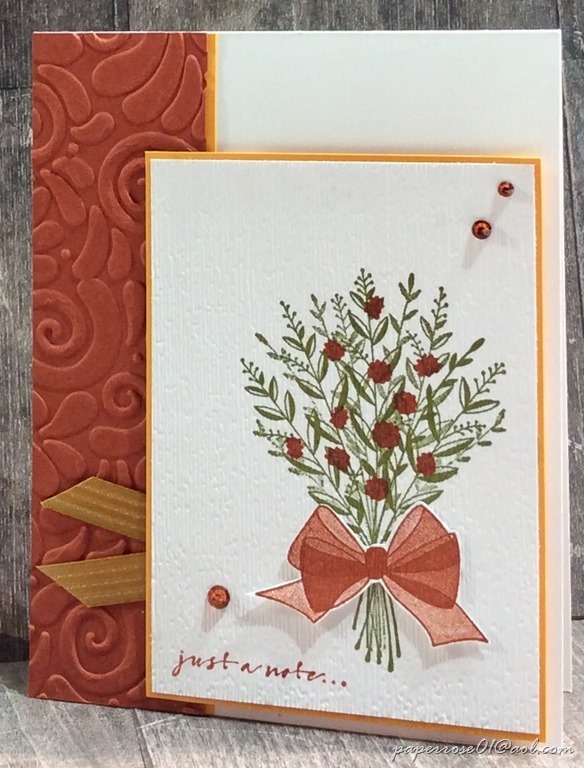 The new “Tin Tile” dynamic embossing folder is used on the top area of the card and the Country Lane DSP is featured on the bottom of the card. 3/8” glittery gray ribbon masks the joining point. The art piece is framed in black and the white layer is embossed with the “Subtle” embossing folder. 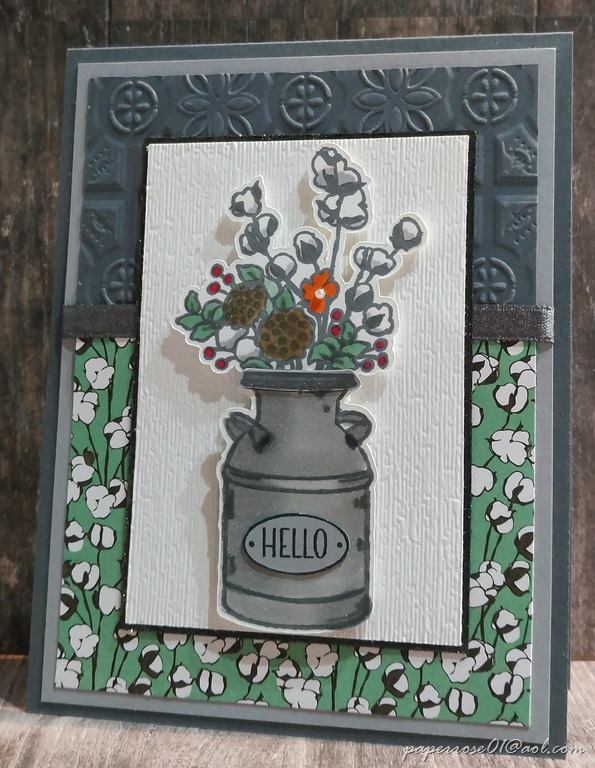 The milk can and the flowers are cut with the Scan’n’Cut and are colored with Stampin’ Blends. The small “Hello” sentiment is stamped on Smoky Slate and fussy cut. The bouquet is adhered with Stampin’ Dimensionals. The milk can uses double Stampin’ Dimensionals at the top of the can and single dimensionals at the bottom. This allows for the flowers to “spring” from inside the milk can. Finally, Wink of Stella highlights the bouquet and areas of the milk can. 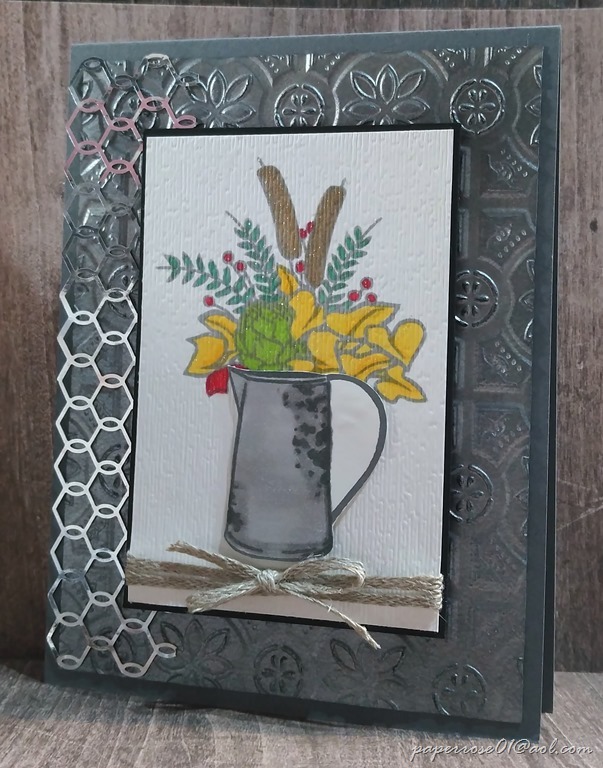 Our last card also features this same stamp set but uses a metal pitcher and a bouquet with cattails and an artichoke. The card is embellished with the Chicken Wire Elements. I would post the card now – but it’s not done! The plan is to complete card 4 and post it tomorrow. As a reminder, November Stamp Camp is Thursday, November 1 from 1 – 7 pm, Friday, November 2 from 2 – 7 pm, and Saturday from 9 am – 2 pm. Please note the Saturday time is only until 2 pm. The cost is $12 for any 4 of the cards and $2,50 for additional cards. Please please please let me know if you plan on attending so that I cut sufficient card stock. Let me know if you have any questions or concerns. Wishing you well is a sweet set that can be used for any occasion – used for Thanksgiving here. The Cajun Craze side panel features the new “Swirls & Curls” textured impressions embossing folder. A hint of Mango Melody peeks thru and also frames the art work. I used the Stamparatus for the Old Olive bouquet of greens and Cajun Craze flowers. This allowed me to stamp multiple times in the exact same spot to deepen the color. Additional flowers could be stamped, but I wanted a simple yet stylish card. Although hard to tell, the “Subtle” dynamic textured embossing folder was used on the art piece after stamping. This embossing folder gives the card stock a linen effect. The Cajun Craze bow was fussy cut and provides just the right touch to the bouquet. Finally, 3 rhinestones were colored with the Cajun Craze Stampin’ Write Marker and adhered in place. This Thanksgiving card could easily be done in red and green or other colors. 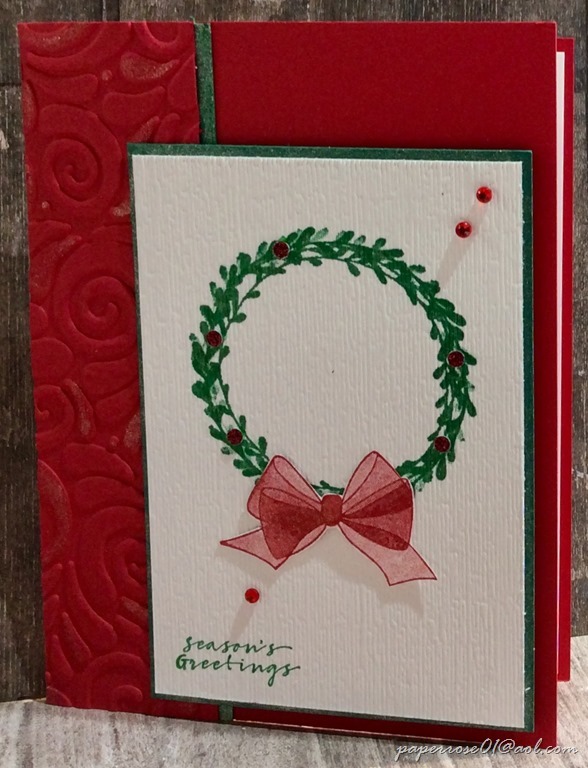 In fact, this set includes a simple wreath and “season’s greetings” sentiment stamp. For this card, Real Red and Shaded Spruce card stock is used with Call Me Clover ink. Although hard to see, a few of the raised “Swirls & Curls” have had Wink of Stella added. Wink was also used on the edges of the Shaded Spruce card stock and on the wreath and bow. The 1/8” circle punch was used to punch tiny red glimmer “berries” which were adhered on the wreath. More berries could be added if desired. Finally, 3 red rhinestones were adhered. The card stock sizes for this card are the same as the Thanksgiving view above. You can choose to do either card or even both but let me know your wishes. The next 2 posts will feature the “Country Home” stamp set – perfect for Thanksgiving or a fall birthday. Daughter Debbie was on Scan’n’Cut duty today and she stamped and cut out the pitchers, watering cans and one of the flower bouquets. We will also be using a small piece of the Chicken Wire Elements, the Galvanized Metallic Paper, and the gorgeous new Tin Tile dynamic textured impressions embossing folder. The next post should come out on Saturday. Remember to check back!